“Investment in the former Macy’s building demonstrates our commitment to this community, State Street and the next generation planning of Paseo Nuevo. 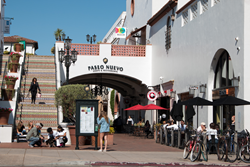 Pacific Retail Capital Partners and institutional investors advised by J.P. Morgan Asset Management, the owners of Paseo Nuevo Shops & Restaurants, announced today the acquisition of the former Macy’s building that was vacated by the anchor tenant in March of 2017. Paseo Nuevo Shops & Restaurants is now positioned to repurpose the 135,000 square foot building to fit the needs of the community and to better serve today’s retail environment. J.P. Morgan Global Alternatives is the alternative investment arm of J.P. Morgan Asset Management. With more than $130 billion in assets under management and over 800 professionals (as of December 31, 2017), we offer strategies across the alternative investment spectrum including real estate, private equity and credit, infrastructure, transportation, liquid alternatives, and hedge funds. Operating from 23 offices throughout the Americas, Europe and Asia Pacific, our independent alternative investment engines combine specialist knowledge and singular focus with the global reach, vast resources and powerful infrastructure of J.P. Morgan to help meet each client’s specific objectives. For more information: http://www.jpmorganassetmanagement.com.